The Stryker family of vehicles has undergone numerous upgrades as a result of lessons learned from combat operations in Iraq and Afghanistan. But now tense relations between the United States and Russia following Moscow’s incursions into eastern Ukraine in 2014, has resulted in a major weapons upgrade for the Stryker IAV. Since the withdrawal of the last US Army Heavy Brigade Combat Team from Europe in March 2013, the 2nd Cavalry Regiment based at Vilseck, Germany and the 173rd Airborne Brigade Combat Team based in Vicenza, Italy and Grafenwöhr, Germany, are the only major US ground forces continuously based in Europe. Since 2014, the 2nd Cavalry Regiment has taken part in numerous exercises in Eastern Europe and the Baltics to demonstrate to Russia that the United States is determined to support and protect its allies against any aggression. The US Army established the Regionally Aligned Force equipped with vehicles like the M1A2 SEP V2 Abrams Main Battle Tank or the M2A3 Bradley Infantry Fighting Vehicle, both of which are prepositioned in Germany and the Baltics. From the very beginning the M1126, M1130, M1132 and M1135 Stryker variants were equipped with the reliable Kongsberg Protector M151 Remote Weapon Station (RWS) which can be armed, for example, with the 5.56 mm x 45 M249 Squad automatic weapon and 7.62mm x 51 M240 machine gun. But the preferred weapons of the Stryker Brigade Combat Teams are the cal.50 M2HB QCB machine gun or the 40mm Mk19 Mod 3 Automatic Grenade Launcher. Whilst the currently-used RWS and related armament mounted on the Stryker IAVs were adequate to engage insurgents in Iraq and Afghanistan, they would be no match for the Russian BTR-82A Armoured Personnel Carriers or BMP 3 IFVs in case of any confrontation. On the 30 March, 2015, the 2nd Cavalry Regiment Commander Colonel John Meyer submitted an operational needs statement for increased lethality for his unit to the House and Senate Armed Services Committee. He requested 81 of his Stryker IAVs to be fitted with 30 mm cannons. This armament was originally part of a larger concept for fleet-wide lethality upgrades before the 2nd Cavalry Regiment picked it for rapid fielding through the operational needs statement. 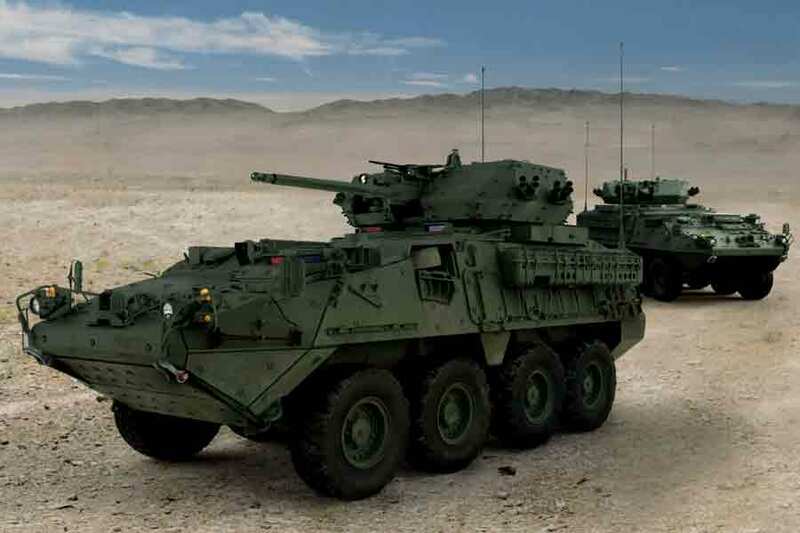 The first $8 million contract with the Stryker manufacturer General Dynamics Land Systems (GDLS) was signed in September 2015 and expanded to $75 million in January this year. A first prototype was presented in December 2015. The 2016 defence spending bill authorised $411 million to upgrade 83 Strykers. 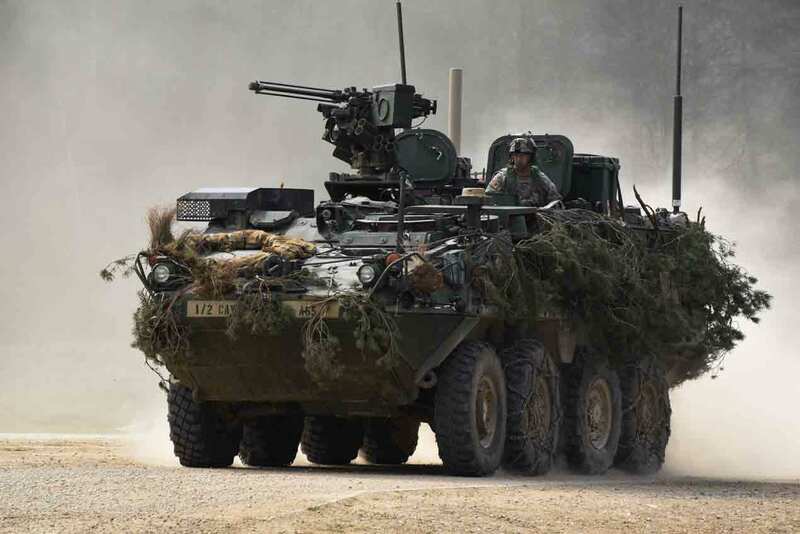 Of this amount $97 million is needed for research, design, testing and evaluation, both of the modified Stryker IAV and of the 30 mm cannon including its ammunition. According to Colonel Glenn Dean, the Army`s Stryker programme manager, the original plan was to take stripped Strykers—the bare chassis left over after a Stryker is converted from a flat-bottom to a double-V hull—and rebuild them into the new 30 mm armed version. However, now it turns out that the US Army has enough complete vehicles to take surplus Strykers and just modify them to take the new turret. One of the many challenges the designers faced in increasing the lethality of the Stryker was the requirement that the interior of the up-gunned vehicles should still have enough space to carry a squad with nine soldiers as well as the driver and the gunner, including their small arms and personal equipment. The turret cannot take up space inside the vehicle. Furthermore, the gunner sitting on the right side of the vehicle behind the power pack should be able to control the turret like they do now with the current M151A2 remote weapon station. In December 2015, the Kongsberg Protector MCT 30 medium-calibre remote weapon station (MCRWS) was chosen by GDLS for this project to up-gun 81 of the current two CR Strykers. The main armament of the MCRWS is a 30mm x 173 XM813 automatic cannon built by Orbital ATK equipped with a link less ammunition handling system for increased reliability compared to a traditional link feed cannon system, which is controlled by the existing gunner's fire controls. According to information from the manufacturer, the MCRWS has 310 rounds ready to fire and can carry both armour-piercing, fin-stabilised discarding sabot and high-explosive incendiary ammunition as well as training rounds. The turret can be accessed and reloaded from under armour. The new cannon will have a much better range of more than 3,000 metres and improved penetration against light armoured targets at the cost of storing fewer rounds. From the beginning of the development, the MCRWS was optimised for firing in static and moving scenarios. Additionally, the cannon will also be able to fire air-burst rounds that will explode above a target, a technique used to engage enemies hiding behind walls. Besides the main gun, the MCRWS will feature a coaxially mounted 7.62 mm x 51 M240 machine gun as well as two smoke grenade launchers each with four tubes on both sides of the weapon station. The MCRWS will be equipped with a powerful CCD video day sight, thermal imager and eye-safe laser rangefinder. As the MCRWS is heavier than the currently used remote weapon station and armament, the roof above the crew compartment needs to be partially redesigned. Currently, the US Army plans to equip half of the 2 CR Strykers with the MCT 30 and the other half with the Javelin ATGM to engage armour targets. The first more lethal Stryker should be fielded in 2018. No decision has been made if all IAVs with the M151A2 remote weapon station will be equipped with the MCT 30 MCRWS. Research and development for the Stryker IAV began in October 1999 when the US Army Chief of Staff General Eric Shinseki outlined the US Army’s transformation to the “Objective Force” by 2010. Among other things, the transformation plans included the formation of medium brigades as an interim force called Interim Brigade Combat Teams (IBCT). The Army originally planned to equip the first units with the new wheeled vehicle as early as March 2001. To meet the early deadline, the Army immediately started searching for an existing vehicle which already met the requirements for its new combat brigades. Originally named the Medium Armoured Vehicle and later designated the IAV, it was intended from the beginning that the Stryker would not replace existing vehicles in the Army's inventory, but instead fill the gap between light vehicles like the HMMWV and heavily armoured vehicles like the M2 Bradley and M1 Abrams. Because of immediate operational requirements, the decision was made to select an off-the-shelf vehicle as the IAV. Afterwards, the US Army Tank Automotive and Armament Command (TACOM) invited interested manufacturers to enter their products in a Platform Performance Demonstration held at Fort Knox, Kentucky from December 1999 to January 2000. In February 2000, the US Army released an operational requirement asking for a family of vehicles which was air transportable in a C-130 Hercules cargo aircraft and rapidly deployable anywhere in the world in a combat-ready configuration. The vehicle, either wheeled or tracked, should be based on an infantry carrier vehicle able to carry a nine-man infantry squad with all its weapons and personal equipment. Other required variants included a mortar carrier, engineer squad vehicle, anti-armour vehicle, reconnaissance vehicle, fire support vehicle, command post vehicle, NBC reconnaissance vehicle and an ambulance. From the beginning, it was obvious that the Mobile Gun System and a 155 mm Self-Propelled Howitzer may very likely be built as special variants. In November 2000, the US Army approved the initial IAV Test and Evaluation Master Plan and on 16 November General Dynamics Land Systems Defense Group was awarded a six-year requirements contract worth an estimated total value of $4 billion to equip the new Interim Brigade Combat Teams with the Stryker IAV, also known as the Light Armoured Vehicle III (LAV III). Initial plans called for equipping six IBCTs with 2,131 vehicles. The Stryker IAV is based on the Piranha III produced by MOWAG of Switzerland, now re-named General Dynamics European Land Systems. Since October 2003, MOWAG has been a subsidiary of General Dynamics European Land Combat Systems Group. 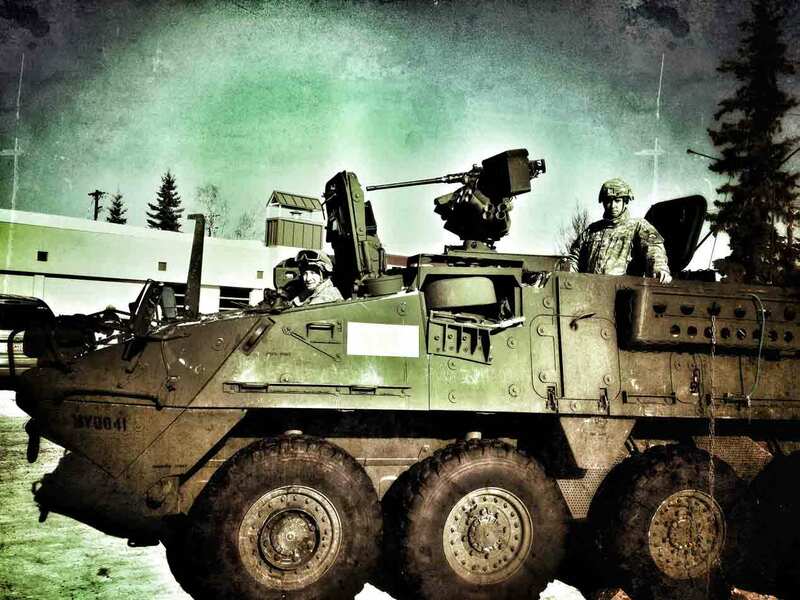 The primary design of the Styker IAV, which is a joint venture between General Motors Defense of Canada and General Dynamics' Land Systems Division in the US, has two variants; the Infantry Carrier Vehicle (ICV) and the Mobile Gun System (MGS).